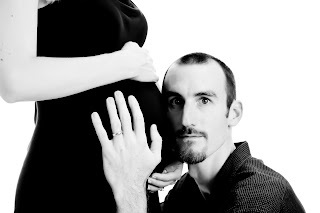 These lovely photos of Eric, me and our Ethan-bump were taken by Aimee Bickers of Pure Expressions Photography. Aimee is a volunteer with Now I Lay Me Down to Sleep, a non-profit foundation that provides professional maternity and birth photos to parents who are losing a child. We are so grateful to Aimee and Now I Lay Me Down to Sleep for this precious gift! A few weeks ago we got the results of the last set of medical tests that might have been able to identify why Ethan’s body developed incorrectly. All of the test results are normal. In one sense, that’s a huge relief – we know now for sure that I do not have any of several possible blood clotting disorders (which might make any pregnancy life-threatening for me and for any other children we conceive). We know that I do not have lead poisoning. We know that Ethan has the normal number of chromosomes in his cells and so it is unlikely that his developmental problems stem from a genetic mistake that might be repeated in the body of a future brother or sister. What we do not know is why this happened to him. It is much harder than I would have expected to live without an answer to that question. When we first learned about Ethan’s developmental problems, some of my first thoughts were about what I might have done to cause this terrible malformation of his little body: Did I fail to take prenatal vitamins faithfully enough in the months before his conception? Could I have somehow forgotten about the danger of Advil to unborn babies and taken one for a headache? Maybe the baths I took to relieve my first-trimester weariness were too hot for Ethan’s developing cells. Or maybe it was the caffeine or the sweeteners in the Diet Cokes that I found hard to give up. Was it because I gave in to my first trimester nausea and food aversions and stayed away from leafy green vegetables for a couple of months? Could it be that growing up in Hancock, which is built on top of abandoned copper mines and surrounded by industrial waste, could have poisoned my body? My mind raced from possibility to possibility. I had a desperate instinctual need to find a reason why this happened, even if that meant living with the horrible weight of my own guilt. Eric and I had a painful argument about this soon after Ethan’s diagnosis. In the aftermath of the argument, we both realized that although undergoing tests for a medical explanation for Ethan’s problems might be helpful, placing blame for his problems would only tear us apart from each other at the moment we most needed each other. We both had to acknowledge that whatever happened to Ethan, it wasn’t because of a lack of intention to care for him well. I have finally, in the past couple of weeks, come to an uneasy truce with the knowledge that I didn’t cause Ethan’s birth defect. Because it is so rare, there is very little medical research available about Ethan’s specific defect, but I was able to find several scientific articles that reassured me that in most cases no one knows why some babies develop with acrania. Certainly all the simple explanations, like maternal diet and vitamin intake, have been investigated and have been found to be insufficient explanations. One of our doctors, an expert in fetal abnormalities, thinks that the most likely explanation is that Ethan had a ‘vascular accident’ – that sometime early in his development one of the blood vessels in my body that supplies him with oxygen had a spasm or developed a clot that cut off the flow of blood to Ethan at a crucial point in time. There is no way to test this theory, but even having a possible explanation helps set my mind a bit more at ease. I suspect that this hypothesis is the closest we will ever get to an answer to the medical question ‘why?’ Since we found out about Ethan’s diagnosis, I’ve learned that having to live without a medical explanation is not unusual – in fact, with 70% of birth defects, no explanation is ever found. As hard as it is, coming to terms with living without a medical explanation is not nearly as hard as wrestling with the theological question ‘why?’ Soon after Ethan’s diagnosis, Eric and I realized that the theological ‘why’ is one of the most potentially destructive questions we could pursue. Just as the medical ‘why’ holds the potential to destroy our relationship with each other, the theological ‘why’ contains the potential to destroy our sense of God’s care and presence when we need it most. Most of the possible answers to this question lead us to terrible, dark, dead ends: Maybe God planned this for us to teach us a lesson or to mold our character. Maybe God chose this for us because God can will whatever God wants to will, and as mere creatures, we have no right to protest. Maybe we are being punished for something we did wrong or for wanting a child too intensely. Maybe God is testing our faith and is waiting to see how we will respond. Or maybe God wants to show the world something through this situation – either through how we bear it or by miraculously healing Ethan at the last minute and proving all the doctors wrong. All of these explanations leave us with a terrible, compassionless God, a God who would intentionally cause the malformation of an innocent child in order to prove something or teach us a lesson. They leave us with a God who stands remote from and unmoved by our grief and the painful reality that Ethan will have to suffer through death almost as soon as he is born. They leave us with a God who causes disease and death, rather than a God who is the overflowing source of healing and life. They leave us alone in our grief, the blind stooges of a powerful but uncaring manipulator. Just as we’ve had to come to terms with the fact that we will almost certainly never know medically why this has happened to Ethan, Eric and I have also concluded that we will never know theologically why this happened. And in the midst of our unknowing, we have had to remind ourselves of what we do know about God and God’s care for us. What I have realized is that the theological question ‘why?’ is really a different way of asking ‘where is God in this experience?’ A week or two after Ethan’s diagnosis, during a walk around the Duke campus wall, my friend Liz asked me that very question. It was a hard question to answer, but a wise one for her to ask. After some reflection, I realized that God has been most present with me through the community of God’s people who have surrounded us with love and support and have joined us in our grief. The tears of the body of Christ have shown me where God is in this situation – God is with us and God is also weeping over the pain of Ethan’s too-short life. If God made Ethan as a reflection of God’s own image, then surely God’s grief over his inevitable death is even greater than ours. If God breathed life into Ethan’s little body, then surely God had even bigger and better dreams for him than we did. If God knit Ethan together in my womb, then certainly God’s heart is also broken over this little unfinished body. The idea that God’s providence or purposes are somehow at work behind tragedies like Ethan’s death is appealing to many people. I think this might be because, in our moments of powerlessness, this thought reassures us that God is in complete control, even if we cannot comprehend what God is doing in our lives. But I’m not sure it’s an honest conclusion. Surely God is at work in our world and in our lives, and surely the promise of the resurrection is that one day the power of death will be completely swallowed up by the God who is the source of all life. But the moment in which we live is somewhere between the promise and its fulfillment. The moment in which we live requires both stark honesty about the realities of our broken world and radical faith in the coming vision of wholeness that God has promised. The moment in which we live requires us to acknowledge that there is much that remains terribly broken about our world, even as we wait in faith for the day when all will be made whole. One of the books that has been most helpful to me in the past couple of months is Hope Deferred: Heart-Healing Reflections on Reproductive Loss (2005, The Pilgrim Press, edited by Nadine Pence Frantz and Mary T. Stimming). It was written by five women theologians who discovered, during a conversation in the women’s restroom at a theological conference, that they had all experienced the loss of a child through miscarriage and that several of them had suffered through long-term infertility. The book is the fruit of their long wrestling with the painful theological questions brought about by these experiences. In one of the essays, Nadine Pence Frantz addresses the question ‘why?’ in the aftermath of the death of her only biological child, Jacob, conceived after seventeen years of infertility and miscarried after twenty weeks of pregnancy. In response to friends who tried to reassure her that her son’s death was somehow part of God’s plan, Frantz concluded that they misunderstood where God was present in her experience. Rather than seeing God as the cause of her son’s death, Frantz writes, “Maybe the struggle with death is an ongoing struggle in which God is also a participant, rather than a distant onlooker.” The death of a child, either born or unborn, is not something God chooses for any of us. Rather, it’s a result of the ongoing travail of all creation, as we wait for the day when the powers of death will be finally extinguished by God’s life-giving love. And in this time of waiting, we are not alone as we weep, but are enfolded in the attending, abiding, creating presence of the God who will one-day destroy death completely. I have found a lot of comfort recently in a vision described in Isaiah 65. It was originally spoken as a promise from God about the restoration of Jerusalem, and of God’s people, given to those who returned to their holy city following the long years of exile and found their city and their society in ruins. Christians later heard in this vision a promise for our world when it is made whole by Christ at the end of all things. It’s a vision of creation recreated and whole, a vision we long for and wait for and pray to see soon. for I will create Jerusalem to be a delight and its people to be a joy. my chosen ones will long enjoy the work of their hands. They will not labor in vain, nor will they bear children doomed to misfortune. This vision of God’s longing for our world not only reassures me that our world will one day be made new, it also reassures me that Ethan’s suffering, and the suffering of all the other children who die before their time, is not what God intends for them or for our world. God’s vision of peace and wholeness declares that one day there will be no more children stolen away from us by death. I know that if I am open and listen, there are things I will learn through this experience. I know that the heart-rending experience of loving and losing Ethan will shape me in life-changing ways. At the very least, going through this dark valley has the potential to make me a more wise and compassionate pastor and friend. But I don’t believe for a minute that God caused this to happen or that this was in God’s plan for Ethan’s life. I don’t believe God wills babies to be born with birth defects any more so than God wills tsunamis or genocides or mass starvation. I believe God hovers like a heartbroken mother, tending to a dying child, among the wreckage of our world. I believe God longs with a longing far more intense than what I feel for Ethan, for the healing and wholeness of all the broken and dying life in our world. I believe God is actively fighting against the powers of death and destruction in our world, and will continue to fight against them until the day that they are no more. And I believe that God is grieving with us as we wait for that day when all of creation will be completely freed from the strangle-hold of death.